Who knows, it may be the kind of novel item that gets 10 minutes of use before being thrown unceremoniously into the bored-with-that bin, or it could become the preferred communication device of choice — but first it needs to get made. We’re talking about The Can, a new project being touted on the crowdfunding Kickstarter site. 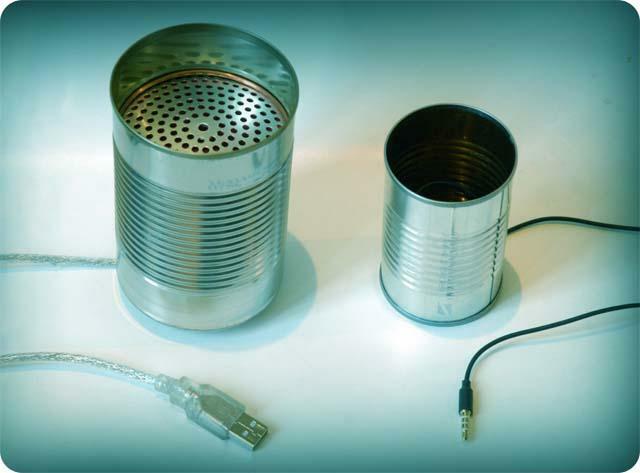 The device comprises a tin can wired up for IP telephone use, complete with mic, speaker and jack to connect it with a computer, phone or tablet. It may look familiar, for as kids most of us at one time or another would’ve probably spent an afternoon playing about with two tin cans connected by a lengthy piece of string, chatting with our buddies down the line. Of course, using it means moving The Can constantly from your mouth to your ear, so if nothing else your arm will get a good workout – just be sure to change hands from time to time lest one bicep starts bulging more than the other, giving an imbalanced and potentially embarrassing look to your physique. The Can comes in Commander and Mini versions, the latter ideal for use with your mobile phone. Wanting to continue with what it calls America’s “long lineage of American-made can-based entertainment,” the design company plans to manufacture The Can in San Francisco, which explains its high funding goal of $30,000. Monkey Wrench Design has until the end of May to reach its target ($2,200 raised at the time of writing) and if it doesn’t, The Can could, like the string-and-tin contraption its based on, become little more than a fading memory. Sure, the idea is a bit bonkers, but it’s certainly fun, and you never know, should those behind the project reach their target, we could soon find ourselves lost in a sea of nostalgia as we once again hook up with friends using nothing more than a simple can (and some bits of tech)….